A young Italian woman risks her life to defy the injustice surrounding her in this touching novel of forbidden love in war-torn Italy. It is autumn of 1943 when German forces invade the peaceful vineyards and olive groves of Giovanna Bellini’s village in Tuscany. At first, the seventeen-year-old finds herself fascinated by the dashing Nazi officers. She has yet to come face-to-face with the harsh realities of war. Her life changes when her brother joins the partisans and recruits her to smuggle food. What began as a lark takes a drastic turn when she’s asked to hide a wounded freedom fighter, for Mario Rava is not just a partisan- he is also a Jew. As Giovanna helps Mario heal, their bond deepens. But the world around them is in upheaval, and terrible truths are slowly being revealed-truths that will endanger countless lives, as well as the love that has grown between them. Moving and powerful, interesting and compelling, Margaret Wurtele’s debut novel is thoroughly enjoyable. 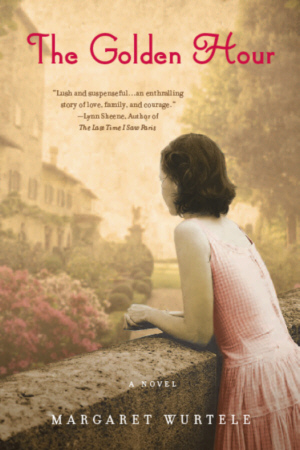 I loved the historical detail and the complexities portrayed in an Italy torn apart by World War II. The quiet elegance of the writing definitely brought to mind The Girl with the Pearl Earring, and I would likewise recommend this book to any book club.